JERUSALEM (CNN) - The Israeli military destroyed a tunnel in northern Gaza with an airstrike on Saturday night, according to Lt. Col. Jonathan Conricus. The 1-kilometer tunnel was only meters away from the border fence near the Erez crossing into Israel and a short distance away from a kibbutz, said the Israel Defense Forces (IDF) spokesman. This is the sixth tunnel destroyed in the past six months. Conricus said the tunnel took months to build and that the military had been tracking its construction for a number of weeks. "Hamas is spreading messages of its desire for a long-term cease-fire but actually digs terror tunnels into the territory of the State of Israel," said Israeli Defense Minister Avigdor Liberman on Twitter. "We're not buying this bluff. We will continue, like this evening, to strike the terror infrastructure." The destruction of the tunnel comes before what's expected to be a volatile week in Israel and the Palestinian territories. On Monday, the US will officially open its embassy in Jerusalem in a move that is expected to spark protests across the region. 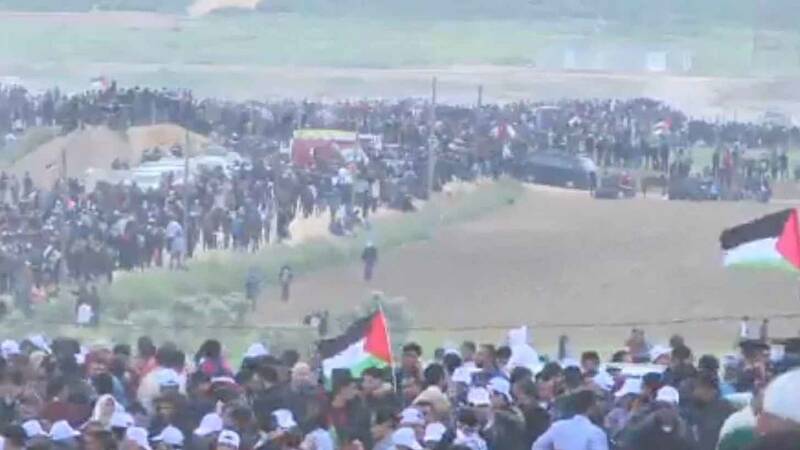 On Tuesday, Palestinians mark what they call the "Nakba" or Catastrophe, in memory of the more than 700,000 Palestinians who were either driven from, or fled, their homes during the Arab-Israeli war that accompanied the creation of the State of Israel in 1948. And the Muslim month of Ramadan also starts this week, which regularly brings a spike in tensions between Israelis and Palestinians. Asked about the timing of the tunnel's destruction coming right before these events, Conricus said, "We were assessing where it was going and collecting intelligence, but when it got close enough to threaten the crossing and a kibbutz, we decided to strike." Israel has increased troops around Gaza and in the West Bank for the week, deploying two extra brigades to the Gaza border and one throughout the West Bank, said Conricus, calling it a "very significant enhancement of what's already there." In a statement, Hamas slammed Israel after the strike on the tunnel, saying, "The Israeli bombardment of the northern Gaza Strip is a miserable and failed attempt to prevent the participation of our masses in the major 'March of Return' and to break the siege on May 14th." Gazans have been protesting along the Israel-Gaza border for more than six weeks. Palestinians are calling for an end to Israel's blockade of the territory and their right to return to lands their families fled or were expelled from during Israel's founding seven decades ago. Israel says the demonstrations are orchestrated by Hamas, the militant group that controls Gaza. On Friday, the IDF said, rioters in Gaza damaged the Kerem Shalom crossing, which is the only facility used to transfer goods and fuel into Gaza, forcing the crossing's closure. Since they began in March, more than 50 Palestinians have been killed by Israeli forces, according to a CNN count based on figures from the Palestinian Ministry of Health. No Israeli soldiers have been killed or injured.